The sun shone into our window and woke me up with its gleaming rays. I rubbed my eyes and smiled, knowing that it was going to be a sunny day. Better shine than rain on this day, right? It was the day we had been waiting for, especially Angel. At last, she was going for her first run at the Cold Storage Kids Run! Slowly, we woke the whole family up one by one, got dressed, packed our essentials and made our way to the Padang. Despite the fact that the sun was scorching hot and ready to melt anyone who stood under it for ten minutes, we saw a steady stream of participants arriving at the scene. Babies in dressed up strollers, toddlers in over-sized shirts, mums in rarely used sports outfits, dads armed with bulky cameras, and even grandparents who were there to cheer their favourite kid on. There were mascots of all shapes and sizes. The Gardenia wholemeal bread never failed to make me chuckle every time it walked past. My girl was in the Blue Sky Chase which was targeted at children 2-4 years of age and consisted of a 800m course. Even though this race was non-competitive, the hubby said that they were going to aim to come in first! 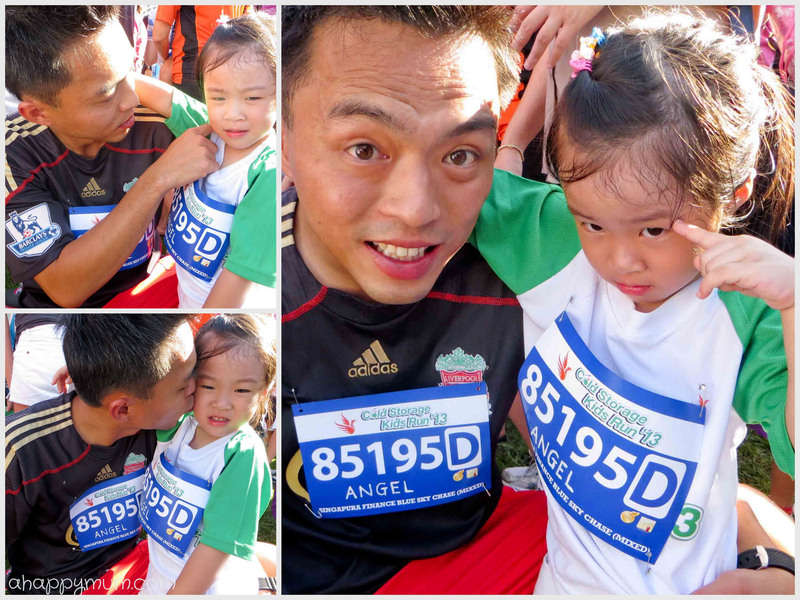 While waiting for the flag off, he pinned on Angel's race bib for her. My girl still appeared half awake so we tried to wake her up with a nudge and a kiss. When all that failed, we told her to open her eyes wide and use eye power to make sure they stayed open. Soon, it was time for the race to begin! Now where was I? At the sideline cheering my heart out with baby Ariel in the carrier. If not for the one-parent-to-one-child rule, we would have loved to run as a family. Can you spot the father and daughter? Zoom in, there they were! It took me ages to scan the crowd and spot them, not to mention that the sun was making me squint every second. This was the mascot for the Blue Sky Chase. Angel saw it and shouted to me "Mummy, look, big bird!" Ready, on your mark, get set, GO! The race had begun! You know what was the joke of the day? The naive me had assumed that even with a baby on my chest and a backpack on my back, I could still jog by the sideline and catch up with my girl. Who knows, within thirty seconds after the race started, the hubby and her zoomed forward with such speed that I lost sight of them. Best as I could, I half jogged half ran and took a short cut to reach the finishing line. There, I waited eagerly with my camera to catch that golden moment when my girl got to the end and stepped on the line. After a long wait with my eyes glued to the track, they emerged from behind me and the hubby told me they had longgggg completed the race and went to get the medal and certificate. In fact, he swore that Angel ran at his jogging speed and they ran so fast that they even caught up with the previous group. She only got tired at the last 50m and gave a weary look but finished the race nonetheless. So, he concluded that they must have taken a total of less than ten minutes. What??!! Ok, I missed that golden shot but still, I must take a picture of the finishing line. 3) Never underestimate the power of the sun. And your kid. To Angel, I still want you to know how proud I am of you for completing your first race! Woohoo! You are my little champ! After the run, we decided to brave the heat and explored the rest of the carnival. 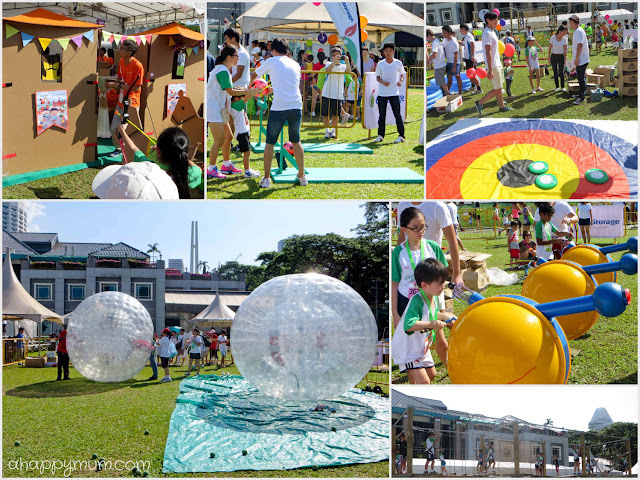 There were various booths set up for kids to play games and win prizes. In addition, there were also goodie bags being given out but trust me, that queue was intimidating. I guess I would much rather spend time letting my girl have some fun instead since this was a day meant for her. Angel chose to try her luck at the Yoyo fishing game where she walked away with a water balloon that bounced like a yoyo and a packet of cereal. Last but not least, she also had the chance to meet and greet Bob the Builder. I didn't know that he could dance too! Time for some crayons! Obviously, after having just met Bob the Builder, she chose a picture of him to colour too. As for the little one, thank you so much for enduring the unbearable heat with Mummy. I am probably the worst mum that day because I forgot to apply sunscreen lotion for you and I had no umbrella while you were in the carrier! 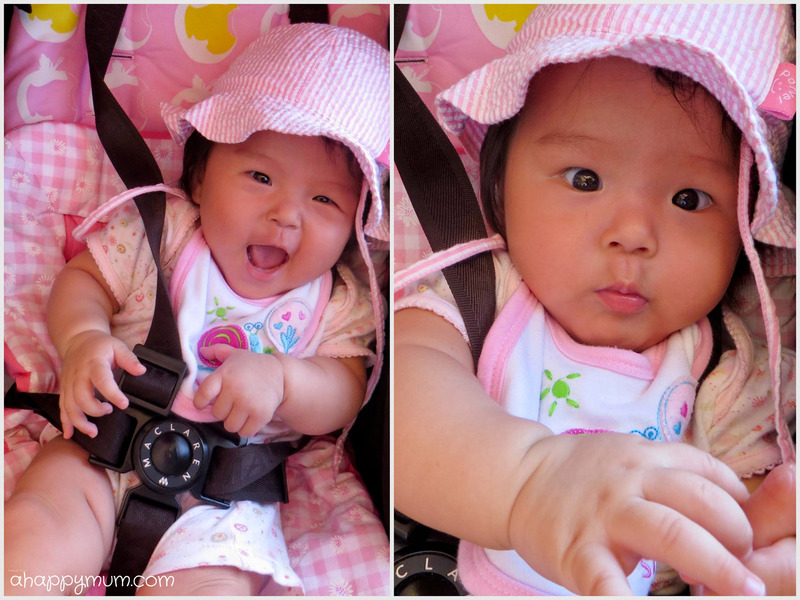 You were so amazingly sweet to have a quick nap when jiejie was running with all her might. Mummy promises to bring you for a run too when you are older and we can have our first family race! To the hubby, a heartfelt thank you for accompanying Angel on the run and making her feel like a champion. I hope this will be the start of many more fun races for our family! Disclosure: A Happy Mum was invited to the Cold Storage Kids Run and Angel received a complimentary entry for the purpose of this event post. No monetary compensation was received and all opinions are my own. 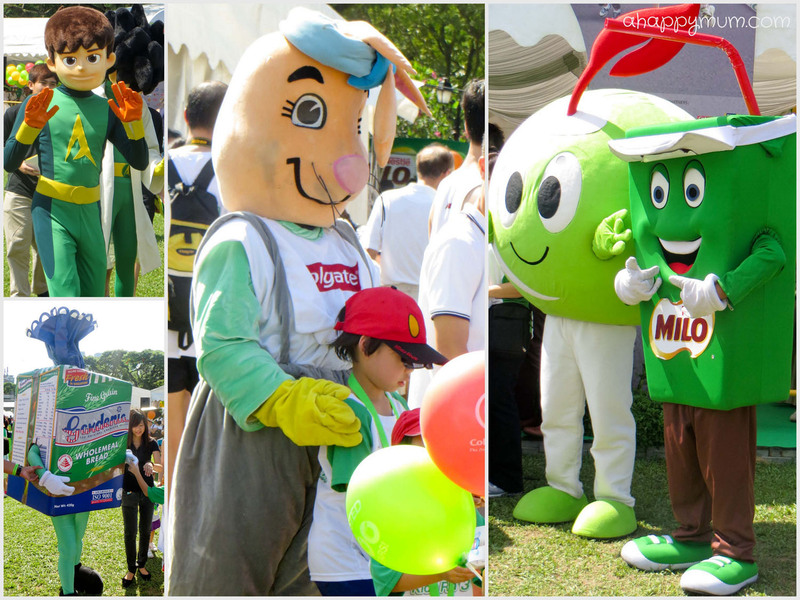 Cold Storage Kids Run 2013 has aptly organised their program. The given pictures prove that. The kids really enjoyed there travel there.